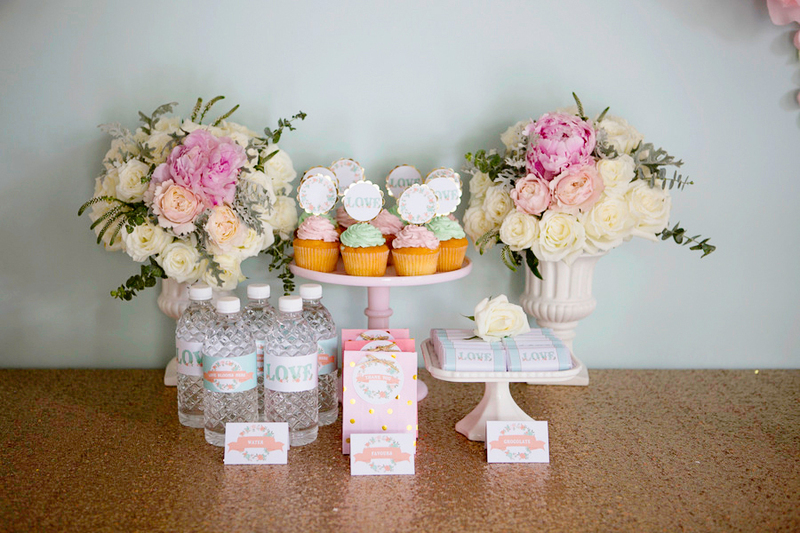 The dessert table plays a big part in setting the tone of your special day, and often ties the theme of your celebration together. 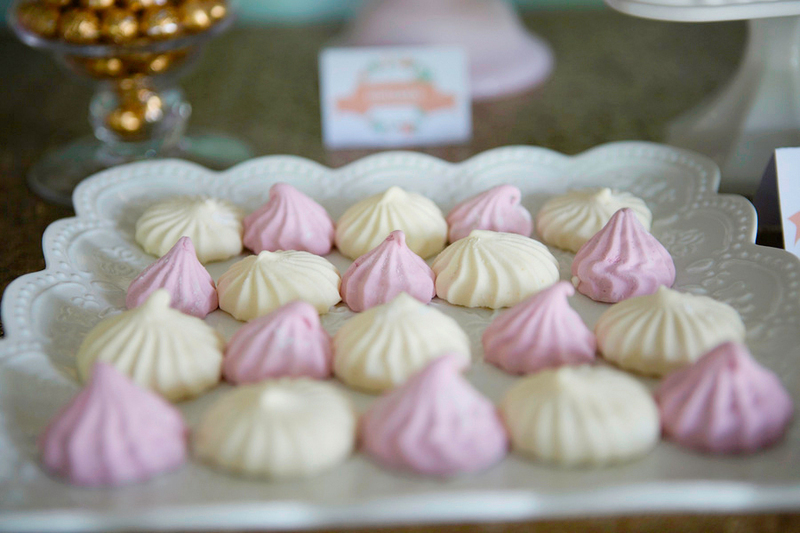 Attempting a table setup yourself can be a daunting task, which is why we’ve invited Wynona Leach of Singapore-based dessert and styling specialist Little House of Dreams to share some top tips on creating a winning wedding spread. In this feature we’re also thrilled to have collaborated with Wynona and Cameron Solutions to create 5 beautiful (and free!) 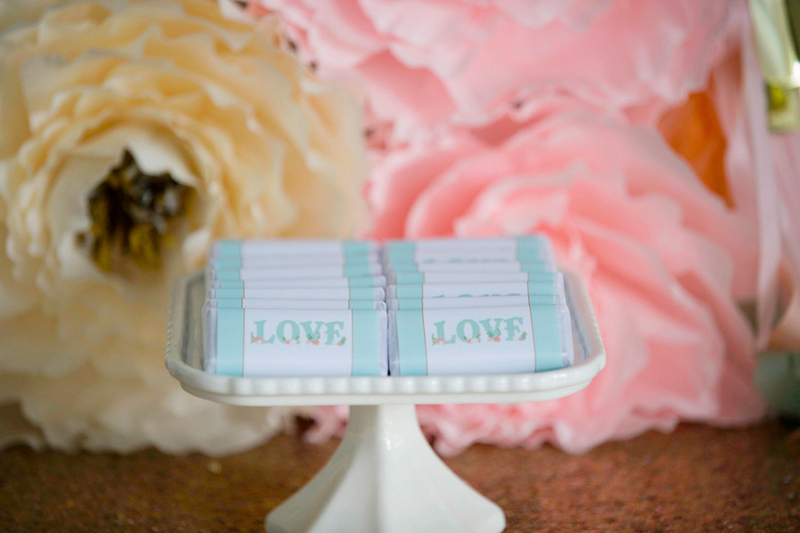 printables which feature in today’s “Love Blooms Here” shoot. Give yourself time to plan - ideally this means at least a couple of months before the event. Jot down ideas as they come to mind, and look out for inspiration that may pop up out of the blue – it could be from a friend’s party you went to, a shop space’s interior or even a poster. Pinterest is a good place to find lots of inspiration, and to pin and organise them onto boards. When you’re looking through magazines, tear out the pages that you like. With the inspiration you have gathered, create a moodboard. Moodboards are a great way to combine your ideas, and are especially useful as a guide for your vendors. Don’t let yourself become overwhelmed with all the planning, create a timeline and schedule to help minimise panic as the big day draws closer. Give some thought to the occasion and venue before thinking of a suitable theme. 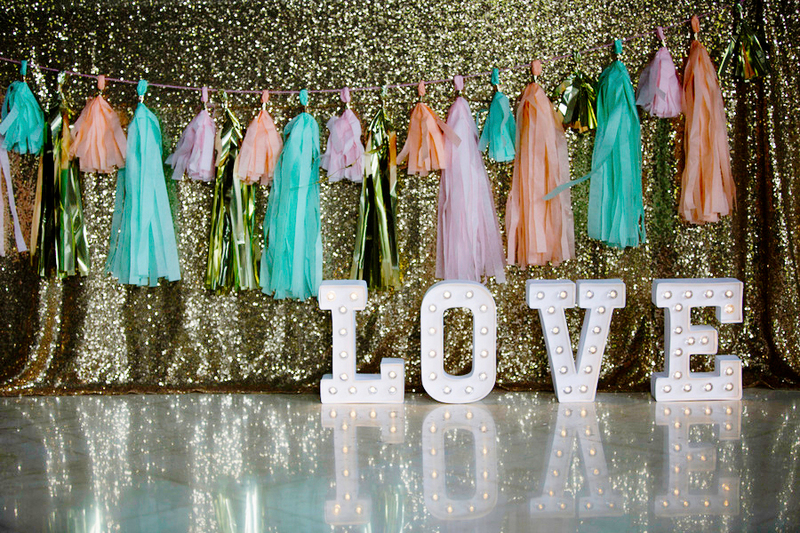 Themes can make your event stand out and really pull the look of a celebration together. You can have so much fun with a theme, either keep it simple or go all out and get creative! Will it be an indoor or outdoor affair? What colours does the space utilise? Sometimes the venue itself will help dictate the theme you decide to go for. Some wedding theme ideas include vintage, rustic, beachy, traditional, classic, retro, colourful, opulent, roaring 20s, modern, whimsical, floral, natural, garden, boudoir, white wedding and destination/travel. Think about your guest list - who’s coming and how many guests are you expecting? Assuming there is a savoury meal beforehand, a cake and at least 4 – 5 other varieties of small desserts and sweets should work well. If you have a large number of guests, you may like to increase the selection accordingly. For example, a wedding with a 100 guests would work with a cake and a spread of 8 – 10 small desserts and sweets. Generally, guests won’t sample everything on offer, so it’s sufficient to cater for about 3 – 5 portions for each guest. Also, will there be children at the event? 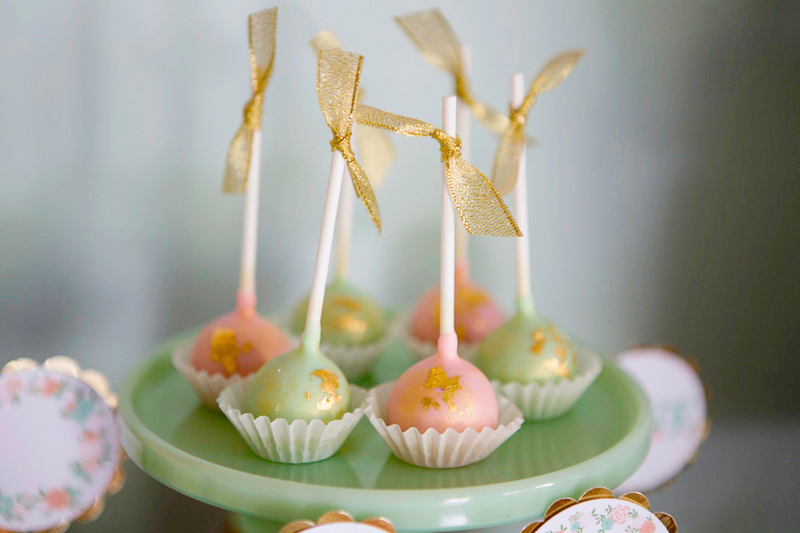 You may like to consider some fun additions such as cake pops, marshmallow pops and thematic candy that will surely make the little ones very happy. For a cohesive look, it’s best to stick to a maximum of 1 – 2 dominant colours in your colour palette. 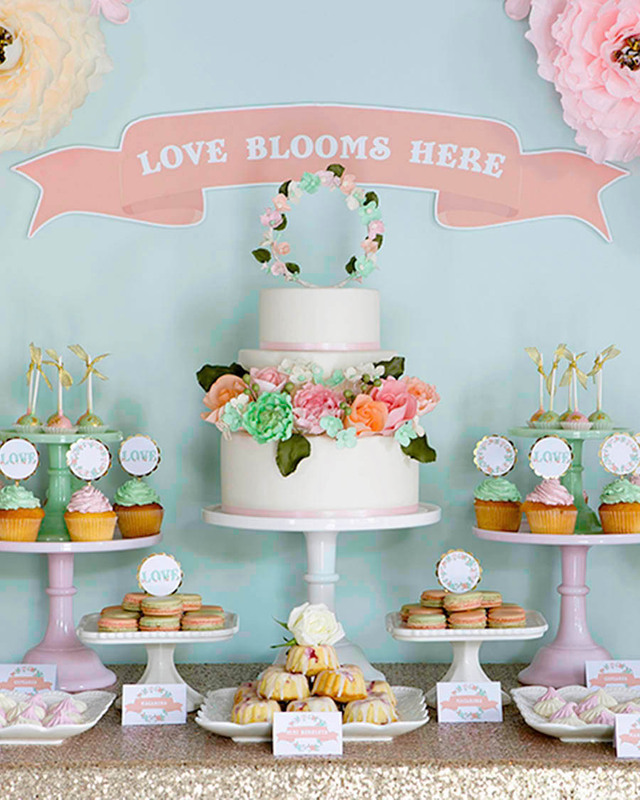 Consider the colours used on everything seen on the dessert table; this includes the cake stands, signage, backdrop, flowers and most importantly the desserts themselves – ensure the colours create harmony on the table. Usually less is more when it comes to colour. For example, plain-coloured serve ware usually presents desserts best, so I would recommend sticking to solid colours such as white, black, gold, pink or silver. Book your dessert vendors early, especially the hero of the table – the cake! Get recommendations from friends and family, and do a taste test if possible. For a nice mix, choose a variety of desserts in different flavours. Consider having a jar or two of candy to shake up the mix. 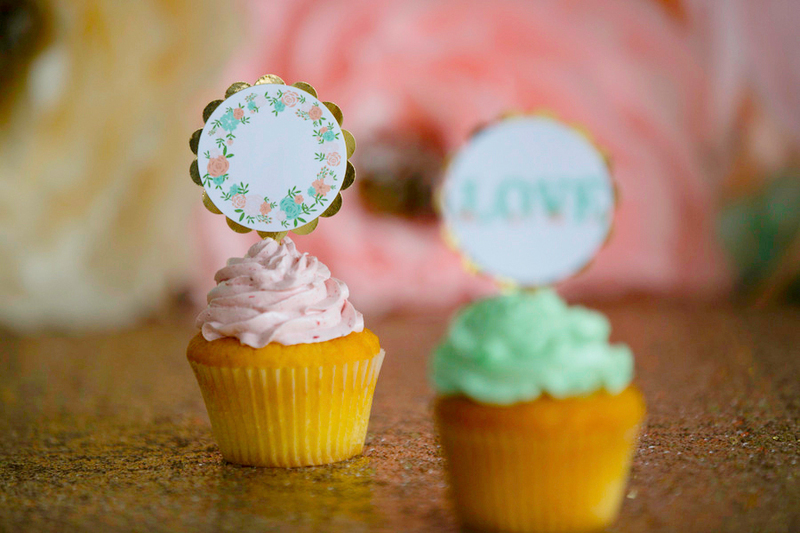 If you enjoy baking or making sweets, add a personal touch to the spread by making something yourself too. One way to make everything more visually appealing is to add different heights to the table. 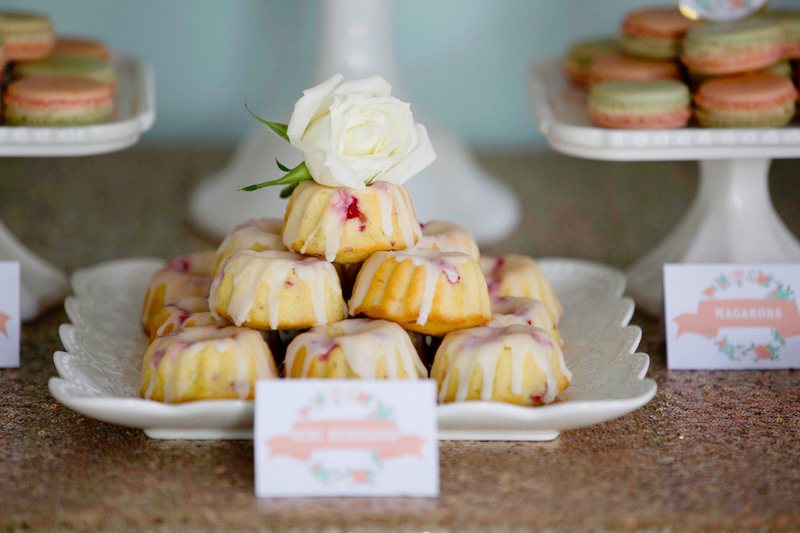 Use cake stands and platters of different sizes, and use boxes, crates, stools, risers, books or even suitcases to present desserts at varying heights. The display does not need to be mirrored exactly on both sides, but symmetry in order to achieve a balanced layout is important. 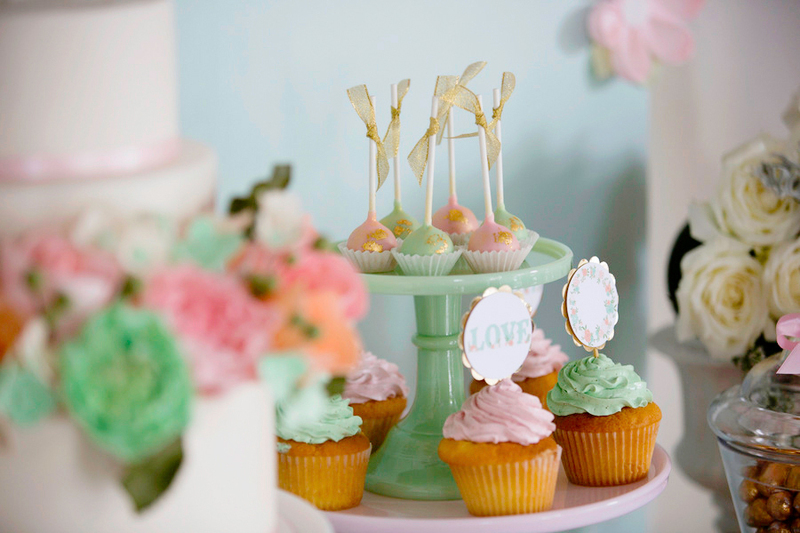 Consider where you can obtain cake stands, platters, vases and props for your dessert table. Will you be buying them new or scouring for secondhand ones? Another cost-effective option is to rent these items. Vendors that offer rental usually carry a wide array of tableware and props for a variety of themes. A backdrop is an important element to consider as it can set the tone of the whole table. 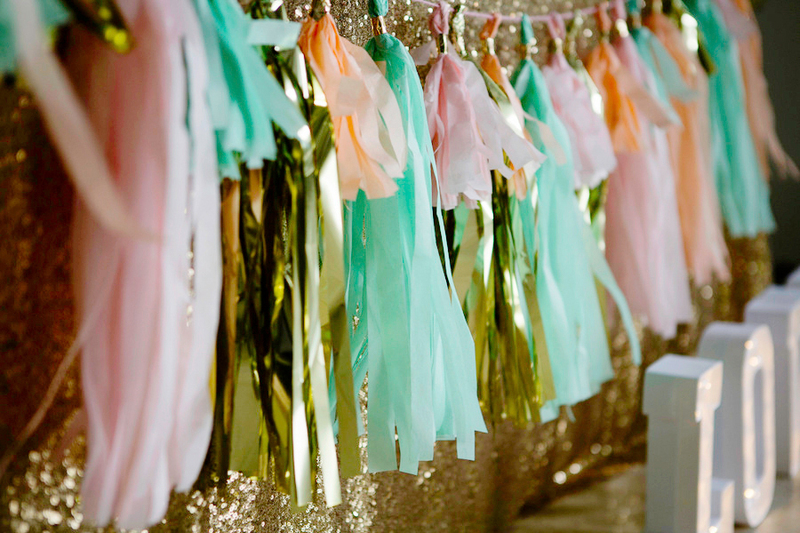 Simple ideas include fabric, ribbons or streamers draped on a backdrop stand. If you are looking for something more elaborate, consider having a professional print your desired design on canvas or mounted paper. Don’t forget to measure your table and the space to make sure everything will fit nicely. 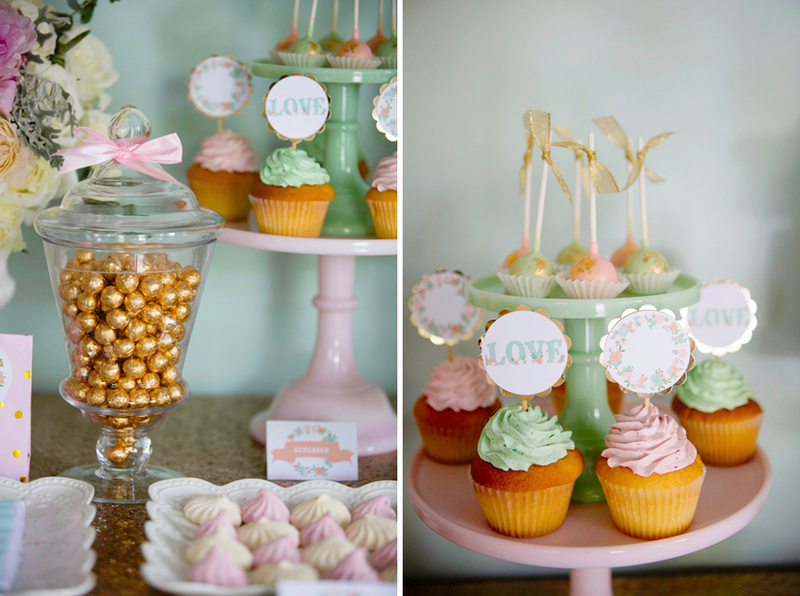 Visualise the dessert spread and how they will appear in front of the backdrop. Ensure that any important text is not hidden by tall props. Printables can make such a difference to your table presentation. 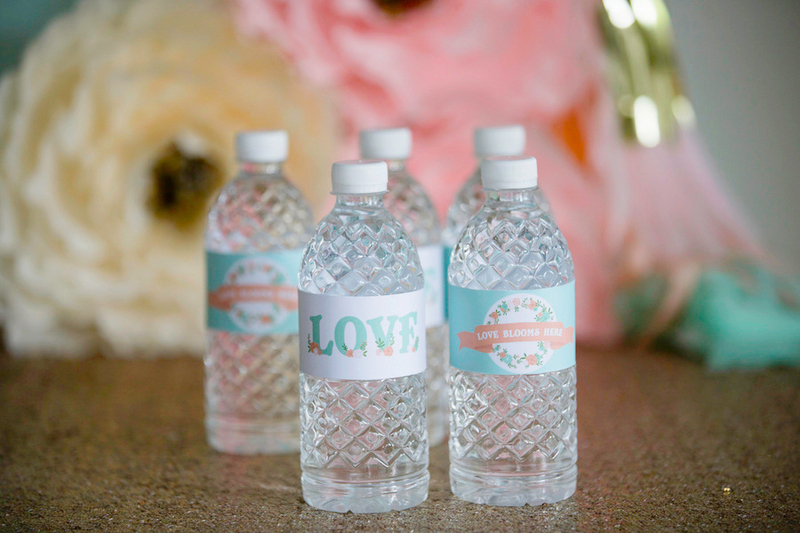 Food labels, cupcake and cake toppers, water bottle labels and chocolate wrappers help to tie the theme together. Printables are inexpensive to buy or if you’re looking for something customised, approach a designer to create something for you. 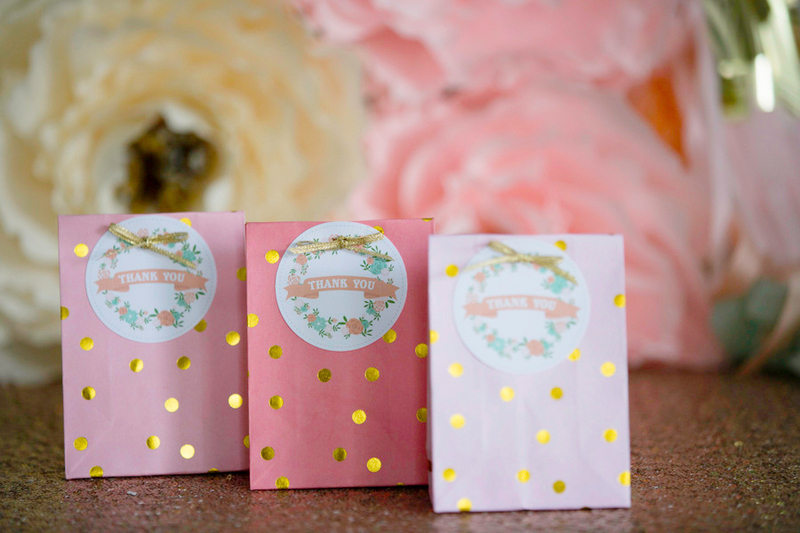 You may like to package some treats individually such as popcorn and candy. 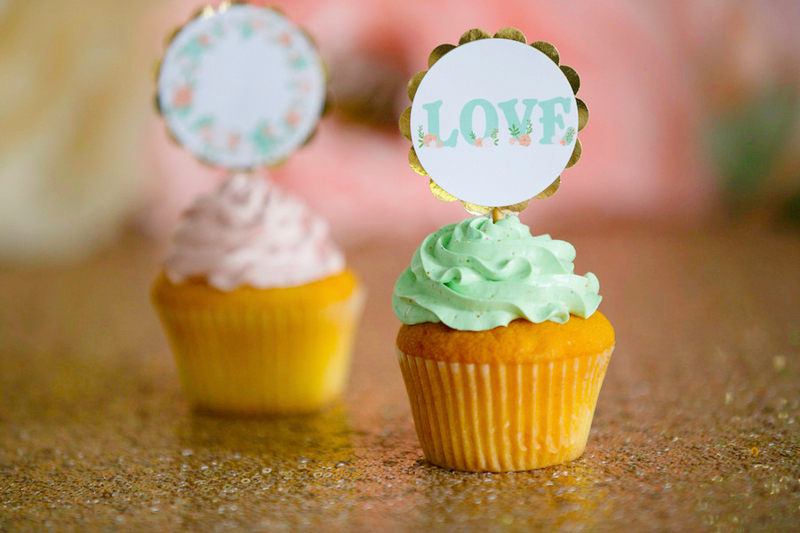 Printable chalkboard signs are great for vintage themes and hand calligraphy is lovely for romantic settings. 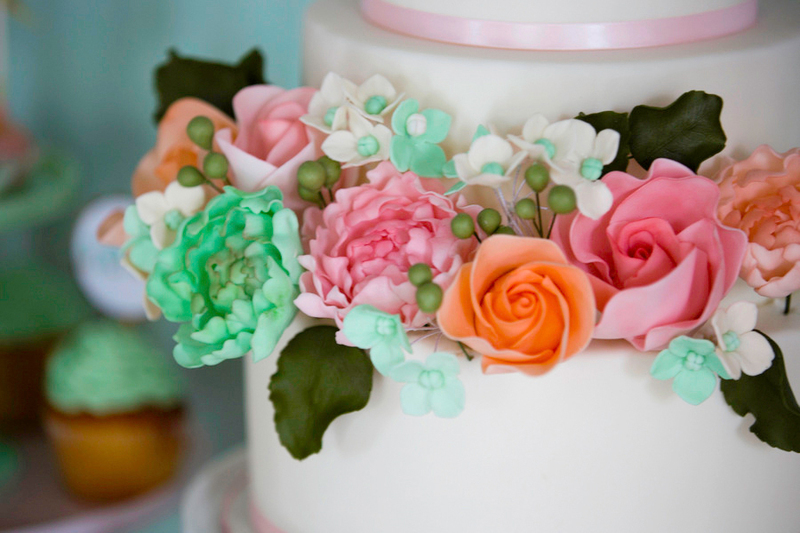 If it suits your theme and your budget allows, nothing really beats having fresh flowers as part of your dessert table. 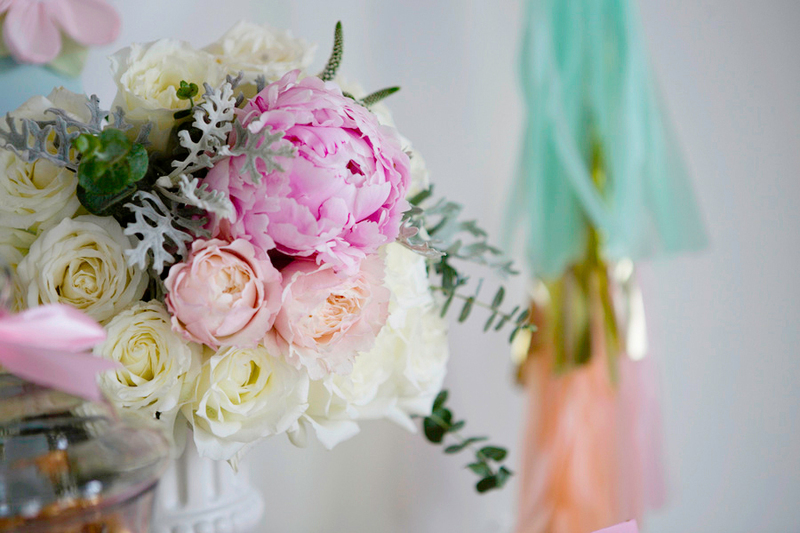 Flowers help complement your colour palette, add some soft touches to otherwise hard surfaces and may even be used as the focal point in your backdrop when strung. Consider adding some DIY to your table for some personality. This could mean getting crafty with decorations such as paper flowers (tutorial on TWS soon!) or adding some framed photos to the layout. Your big day is a great excuse to start on a meaningful project, just remember to have fun and enjoy the process. 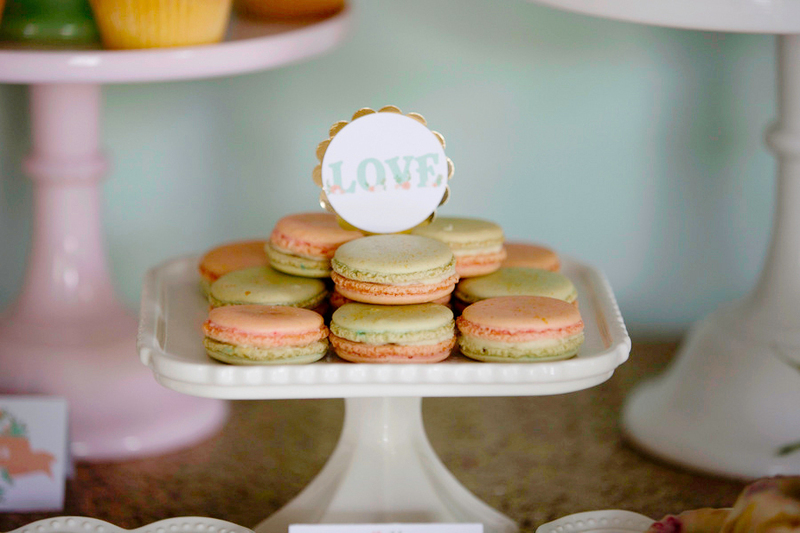 Remember one easy rule: It’s pleasing to the eye to have a main focal point on a dessert table. 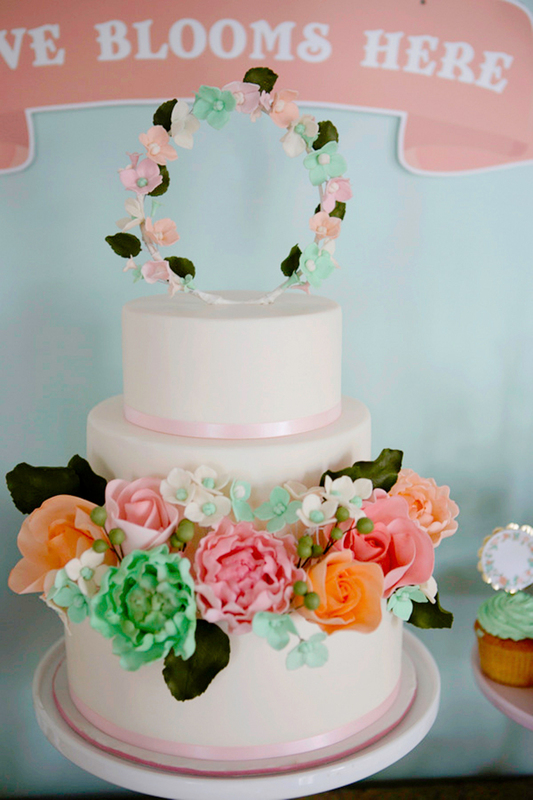 Often the cake is the star, but you may also consider a floral centerpiece or a tiered cupcake stand as alternatives. 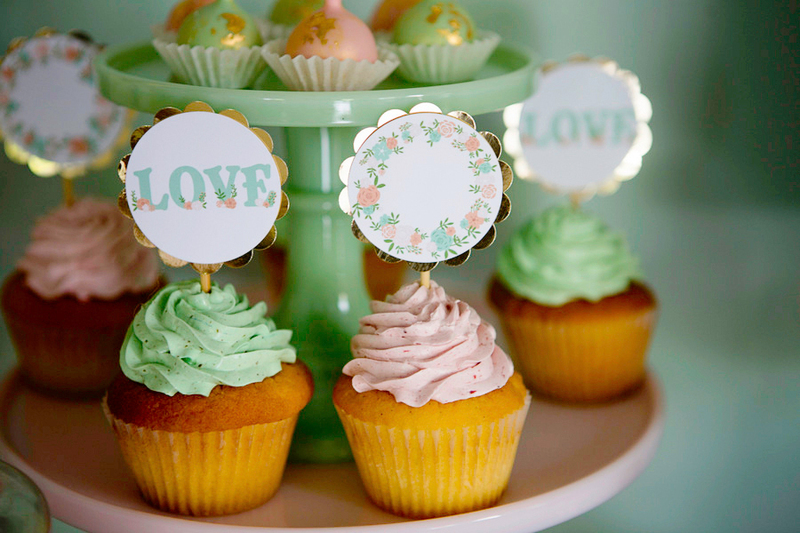 Draw attention to the focal point by placing it higher than the other items – perhaps on a beautiful cake stand or another platform. You can also consider framing the focal point in various ways; a floral arch or with the backdrop design for example. Another important consideration is the table used for the display. 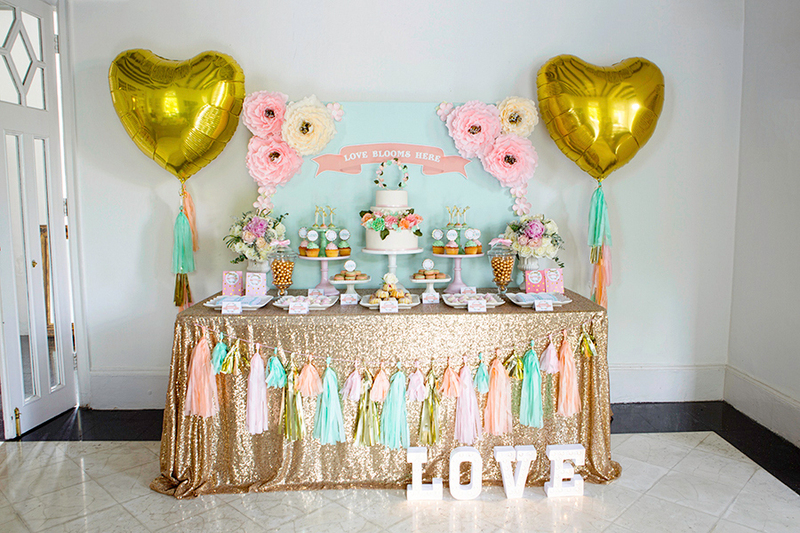 A standard size dessert table stands at 6 feet wide, but this can vary greatly depending on the number of guests, amount of desserts, as well as other factors such as the space and theme. Consider alternative furniture such as antique dressers or sideboards. Lastly, will you be dressing your table with tablecloths and/or runners to match the theme? Sometimes, you may not need a table cover at all; a beautiful wooden table is sufficient if your theme is rustic. Thank you so much for sharing your expertise and tips with us, Wynona, we’re sure they’ve inspired our readers to embark on their own dessert table projects! We would also like to thank our wonderful team of vendors who collaborated with us on this beautiful shoot. Sharing your creativity with our community is a joy and privilege! Feeling crafty? 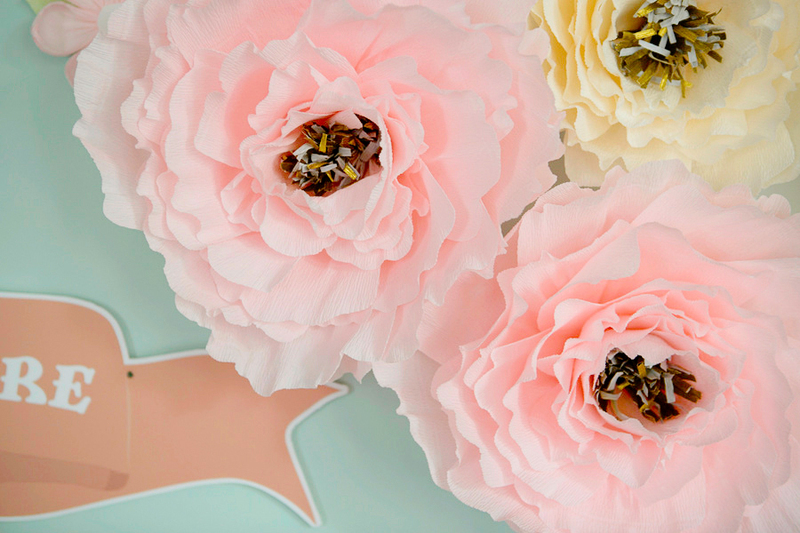 Learn how to make the beautiful paper flowers which you see in this dessert table’s backdrop here! 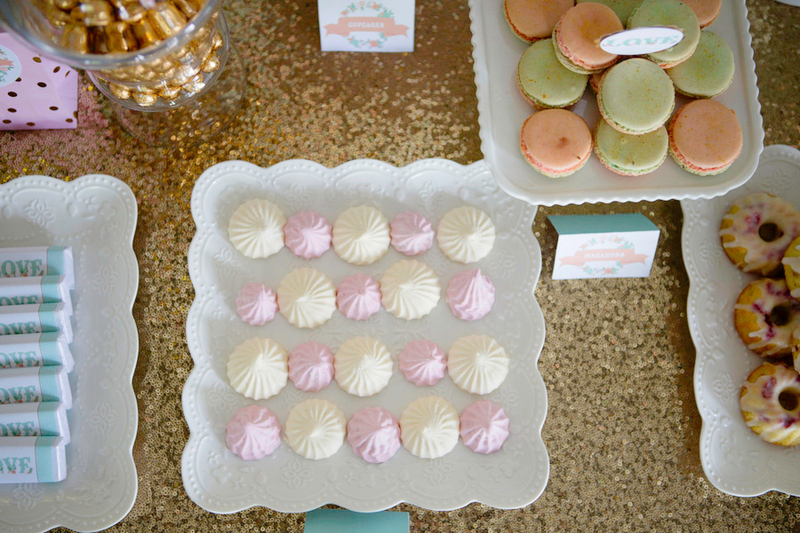 Have you styled a dessert table on your own, Wedding Scoopers? 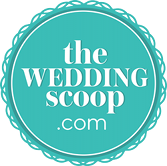 Share them with us over on Instagram or Facebook or drop us an email at info(at)theweddingscoop(dot)com. 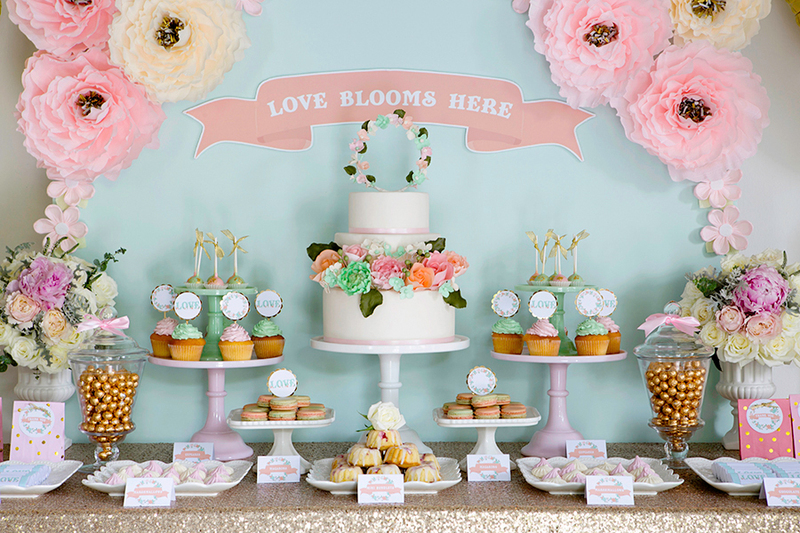 We just might share your beautiful dessert tables with our community!